Beyond the immediate breathtaking landscapes of six islands are multiple miles of additional picturesque panoramas. 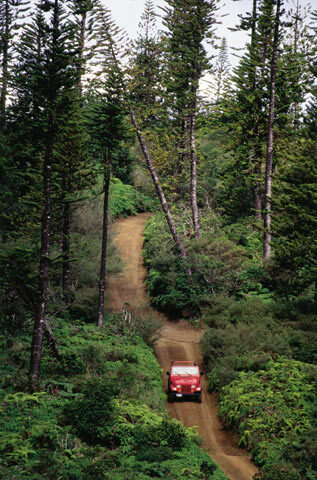 Venturing via four wheeling, the remote patches of undiscovered territory that are as yet unknown to some travelers, exists the genuine and less-traversed beauty of Hawaii. Conventional, typical, tourist-trap, and anticlimactic, are all forgotten phrases once the familiar is abandoned for sometimes hard-to-find finds. Polihale Ridge Road (5.3 miles) - Polihale State Park is the western most publicly accessible area in the United States. Dirt sugarcane roads, the dramatic Na Pali Coast, sand dunes, and an elevation gain of 1,960 feet are reasons enough to explore, and even camp overnight. It is open year-round, swimming is permitted at the Queens Pond, and seasonal kayaking is one of the few water-related pursuits available. Access this road via Highway 550 between mile markers 12 and 13 from Waimea: Turn at the Polihale State Park Picnic Area and stay on the unpaved road. Also accessible along Highway 550 are a number of drives: Haeleele Ridge Road (6.5 miles, elevation gain 2,180 feet), Contour Road (6.3 miles), Kaaweiki Road (4.3 miles, elevation gain 1,917 feet), Kauhao Ridge Road (5 miles, elevation gain 1,917 feet), Lapa Ridge Road (1.75 miles, elevation gain 320 feet), Milolii Ridge Road (3.8 miles, elevation gain 540 feet), and Papaalai-Mana Ridge Road (8 miles, elevation gain 2,410 feet). Lapa Ridge Road is located between Papaalai Ridge Road and Haeleele Ridge Road along Contour Road. Molokai Forest Reserve Road - Drive Maunahui Road or Main Forest Road, also Molokai Forest Reserve Road, for views of Waikolu Canyon, with sea cliffs, waterfalls (the grandest at more than 3600'), and plunge pools. The adventure includes the Waikolu Lookout and Kamakou Peak (elevation 4,961 feet), which are part of the Kamakou Preserve. Picnicking and overnight camping are both options. Take a right turn at the fork (mile 5.7 off the Main Forest Road to the Wailuku Overlook Road). The Lua Moku 'Iliahi, the Sandalwood Measuring Pit, appears on the left after driving approximately nine miles. Continue driving a little more than one mile to arrive at the Kamakou Preserve and the Waikolu Lookout. Maunaloa Highway - The Mo'omomi Preserve is accessible via Highway 460, Maunaloa Highway, from Kaunakakai (right onto Highway 470 to Kualapu'u left on Highway 480), and the drive leads through Mo'omomi Beach, Kawa'aloa Bay, and the sand dunes of Keonele Beach. Scenic spots and sand dunes, with historic ancient Hawaiian burial sites, amidst incredible shorelines make this drive a worthwhile one. Munro Trail - See four islands at various points along Munro Trail, a 10.5 mile trail that passes over Lana'ihale, which is the highest mountain peak on Lanai. See the mountains, coast, valleys, forest areas and more on this drive, not one that every traveler attempts. Mokuleia Firebreak Road (Mauka) - The drive leads to Kuaokala and Mokuleia forest reserves, which allow for scenic hiking, mountain biking, bird watching and camping. Drive towards Kaena Point on Farrington Highway to Yokohama. The excitement of Mokuleia Firebreak Road heightens beyond Kuaokala Trail which leads to Kealia and Mokuleia Trails. Poamoho Hele Loa Road - The mountainous, narrow, dirt road meanders through old pineapple fields and then makes a dramatic change to a native landscape of Uluhe fern and Koa and Ohia trees, all making for an exhilarating drive. Though Poamoho Hele Loa Road is a dirt road, the speed limit is 15 miles per hour and drivers should keep alert for the speed bumps, turn outs for two-way passing, and the surveillance cameras monitoring the road. Mauna Kea Access Road - Lava flows, the Waimea Plain, Kohala Mountains, views of Maui, and elevations ranging from 7,000' and 9,000' comprise this constantly scenic drive at the Mauna Kea Forest Reserve. Ainapo Road - The drive explores the Kapapala Forest Reserve, with the native Koa and Ohia trees, plus plentiful opportunities to view native forest birds, including Apapane, I'iwi, Amakihi and Elepaio. A worthy mention is South Point, Ka Lae, and Green Sand Beach. The rareness of seeing a green sand beach is an opportunity itself, plus the bragging rights of visiting the southernmost point in the United States. Skyline Switchback - Mostly barren yet still scenic, with the Mamane tree dotting the landscape till reaching an elevation of 8,600' at Kanahau, the drive is challenging with many switchbacks. Polipoli Access Road - A drive through seemingly hundreds of trees (cedar, pine, redwood, fern, cypress); views of Kaho'olawe, Moloka'i and Lana'i; and opportunities to camp at Polipoli State Park round out the difficult task of the 10 best places to four wheel drive in Hawaii. Always check details before venturing an adventurous drive; State park sites and visitor information, weather details, camping information, etc. It is also critical to travel with a full gas tank, plus food, water, and other basic necessities. Be sure your vehicle has 4 wheel drive and you are very familiar with basic four wheeling safety tips and procedures. The islands each offer history behind the driving trails, with many of the rich stories told through the scenery along the way. Be sure to check Car Rentals in Hawaii for the best rates available through SummitPacific.